Unfortunately, very few remote Indigenous communities have access to veterinary services, and as a result of indiscriminate and uncontrolled breeding, animal numbers are excessive and the health and body condition of dogs can be poor. Students de-sexing a dog in their make-shift surgical theatre. Communities are also adversely affected the noise of dogs barking and fighting at night, rubbish displaced from bins, and the aggression of some dogs towards people. Over recent years, three initiatives by Melbourne Veterinary School (MVS) staff have led to the development of significant professional veterinary relationships with a number of Indigenous communities in Victoria and the Northern Territory. In 2018, 23 final-year Doctor of Veterinary Medicine (DVM) students – around 18 per cent of the cohort – participated in these programs. The students provided valuable professional support to the veterinarians leading the programs and benefitted immensely in turn from the professional and cross-cultural experiences of living and working in an Indigenous community. West Arnhem Dog Health Program (WALDHeP) began in 2005 to provide annual veterinary visits to the remote community of Gunbalanya in West Arnhem Land. Every year since then Associate Professor Liz Tudor has led a team of veterinarians and final-year DVM students to Gunbalanya. The students and staff perform surgical de-sexing of dogs , house-to-house visits to provide internal parasite and scabies medication to all dogs in the community, and other veterinary services as requested including lump removals, repair of lacerations and other wounds and humane euthanasia. Dr Cam Raw (left) and Associate Professor Elizabeth Tudor with students and local staff. While regular visits have seen dog population numbers stabilise, there has been a worrying increase in cat numbers in several communities in recent years, and the visiting teams now also deliver de-sexing of cats. These consistent visits have allowed MVS staff to establish lasting relationships and deliver ongoing progress towards improved animal and human health outcomes in these communities. Almost 100 students have participated in WALDHeP over the past 14 years, and many have returned as graduates to contribute to the program. The program reflects the One Health research focus of MVS and the Faculty of Veterinary and Agricultural Sciences. The One Health approach recognises the interdependence of human, animal and environmental health and welfare, and that solutions in one area of health can deliver benefits to others. In July 2018 Associate Professor Tudor, One Health resident Dr Cam Raw and six final-year DVM students spent two weeks in West Arnhem Land and in the West Daly region. They visited Gunbalanya, the communities of Croker and South Goulburn Islands, a number of smaller homeland communities, and Palumpa and Peppimenarti in the West Daly region, completing more than 300 surgical procedures. Ten students have already been selected for the July 2019 program. WALDHeP are very grateful for the support of the Yulgilbar Foundation, who have pledged $45,000 over three years to support the further development of WALDHeP. The Melbourne Veterinary School established a partnership with the East Arnhem Regional Council to assist in the delivery of animal health programs in East Arnhem communities in 2016. During 2017-2018, MVS staff member Dr Cam Raw has been based in Galiwin’ku on Elcho Island, delivering animal health services to Galiwin’ku, Ramingining and Milingimbi, supported at intervals by final-year DVM students on clinical placement. During their placement students provide valuable assistance with routine veterinary service delivery and participate in data and sample collection for One Health research initiatives. The students also gain immense benefits in terms of enhanced cross cultural understanding and respect for Indigenous knowledge and history. 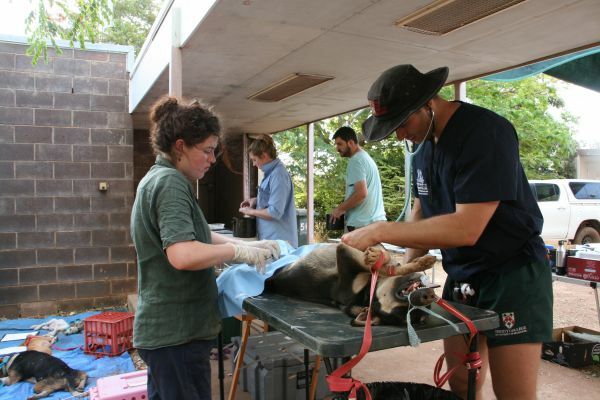 Staff and students set up surgeries to deliver veterinary care in sterile conditions; in Lake Tyers (pictured), the team converted a carpenters’ workshop into a clinic with reception, surgery and pharmacy areas. 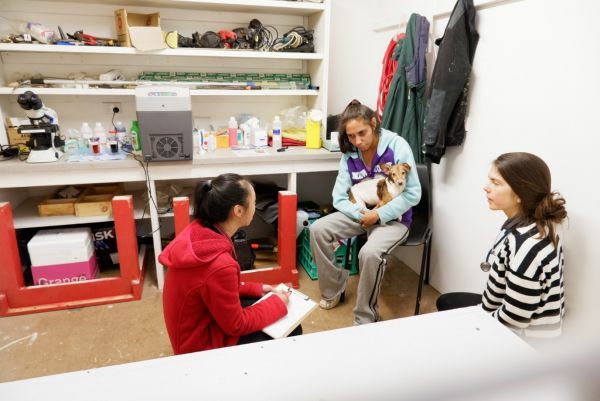 Melbourne Veterinary School staff and students make Indigenous Animal Health Project visits to remote communities each year. In August 2018, Associate Professor Thierry Beths, Dr Stewart Ryan and Dr Jeewantha Wijesinghe led ten third- and fourth-year DVM students from Melbourne and two final-year veterinary bioscience students from La Trobe University in a one-week visit to the Rumbalara Aboriginal Co-operative in the Greater Shepparton area of the Goulburn Valley. 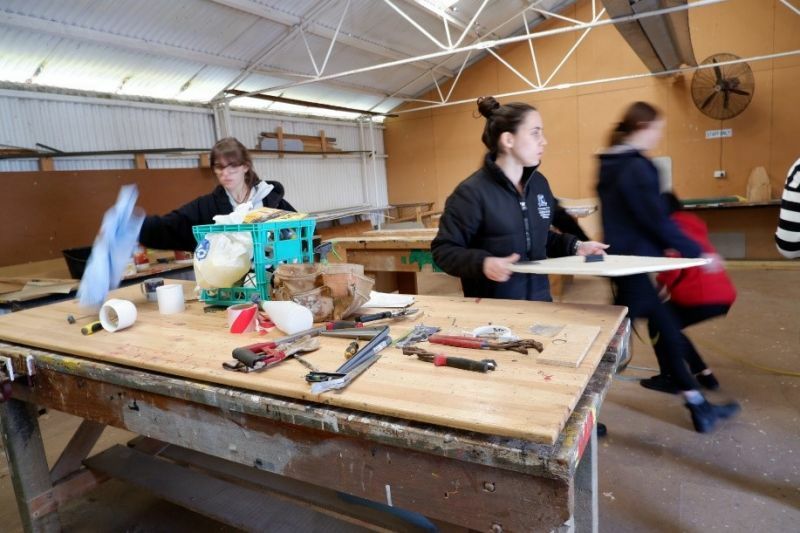 Students deliver a consultation in Lake Tyers. Associate Professor Beths and Dr Wijesinghe followed this with a visit to the Lake Tyers (Bung Yarnda) community in Gippsland with ten Melbourne DVM students and three La Trobe veterinary bioscience students in September. In both visits, staff and students set up temporary surgeries and delivered first-opinion veterinary care to community members’ animals, including de-sexing, vaccination, flea and tick treatment and prevention, deworming and general health checks. In Shepparton, the team worked in a warehouse converted into a temporary surgery. The staff and students saw 53 animals for surgery and medicine consultations and check-ups over three days. They also delivered education in animal welfare and parasite control, as well as education for owners on how to maintain the health of their pets. The students gained a unique learning experience in a real-life setting, and those in the DVM augmented their education with increased knowledge of animal husbandry, welfare, handling, anaesthesia, analgesia and surgery. Staff and students also developed greater awareness about Indigenous history in seminars and meetings with community members and Elders, which will allow them to better serve this community in their careers. The September visit to Lake Tyers followed a similar structure: staff and students set up a temporary clinic in a carpenters’ workshop, complete with a reception area; a surgery room with two surgery tables, three anaesthesia machines and vital monitors and a preparation table; a pharmacy and separate recovery rooms for cats and dogs. 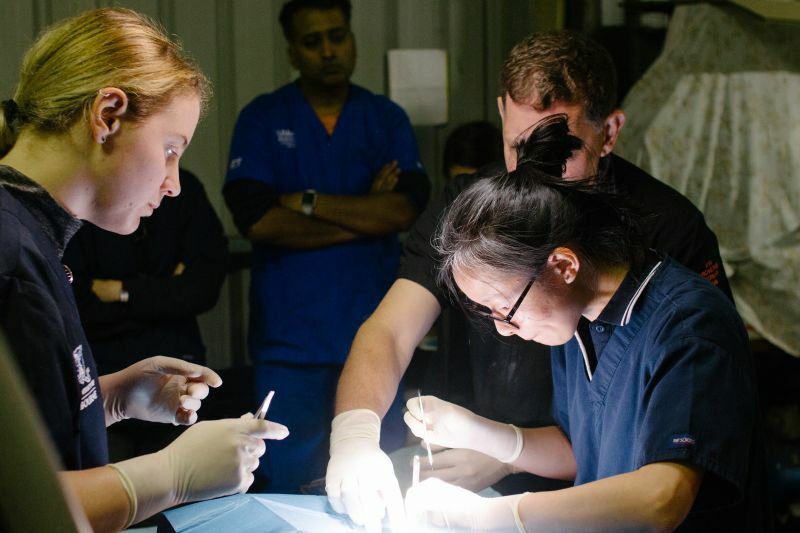 In Shepparton, DVM students undertake surgery under the supervision of Dr Stewart Ryan, Senior Lecturer in Small Animal Surgery and Dr Jeewantha Wijesinghe, surgeon at the University’s U-Vet Hospital. The team delivered surgery consultations and check-ups for eight animals and medicine consultations and check-ups to 32 animals – dogs, cats and even a rabbit. All the patients went home with a goody bag consisting of pet care products. After packing up the clinic, the team met with Gwayne, an elder from the Lake Tyers Aboriginal Trust to learn about the organisation’s history. Once night had fallen, Gwayne and Dr Duane Hamacher, an expert in Indigenous astronomical and geological knowledge and traditions from Monash University, delivered a talk to the team and the community on aboriginal astronomy. Dr Hamacher showed the team the moon, Mars, Jupiter and its moons, Saturn and its rings through a telescope, as well as Indigenous astronomical signs. 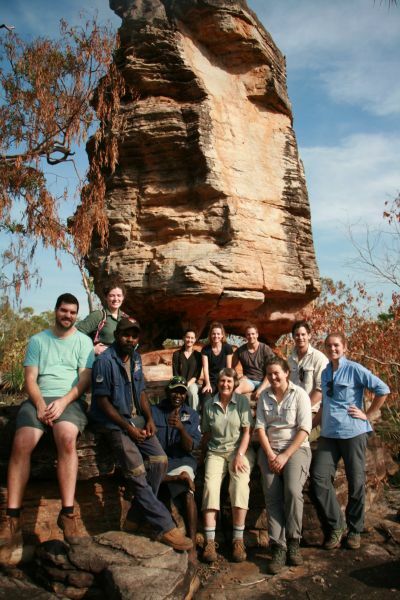 Banner image: Staff and DVM students in West Arnhem Land.